This CAT5/CAT6 to BNC Video Balun with Fly Lead used for sending and receiving baseband video through computer network cable.This is a "one channel passive video transceiver". 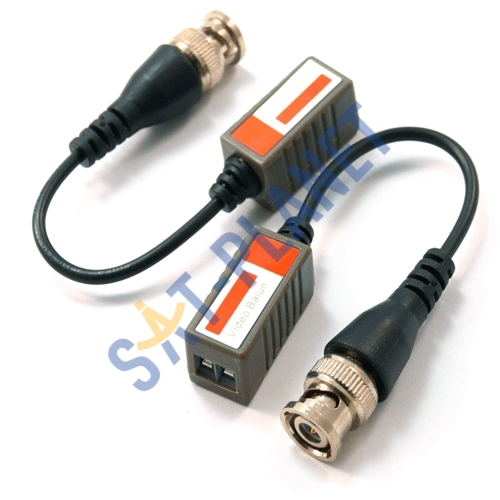 Use one at either end of the pair of cable.It has two screw terminals for connecting a twisted pair of wires from CAT5 cable, with BNC connector.Using this product, you can save some of the cost of cable, because CAT5 cable is often cheaper than standard video cable (RG59). Often, because there are four pairs in CAT5 cable, you can successfully send four video signals down one cable!Note that transmitting video in this way is analogue (doesn't use the computer network). Obviously the pair of wires used in this fashion must be dedicated to video use, and not part of the computer network. This product will work best in most cases with unscreened CAT5 cable.The male BNC plug and the slimline design often allows connection directly to the camera or DVR 's BNC socket.